Are you ready for a new experience, Kansas City? Painting With A Twist is a great place to have fun with your friends or meet new ones. Relax, let your hair down, and just be you. Discover your inner artist. Bring a bottle of wine or your favorite beverage, and paint along with our artist. You'll create a work of art to take home at the end of the evening. We provide all painting supplies and artist instructions. No art experience is needed! Two-hour classes are just $35 and three-hour classes start at $45. Most of our classes are open to anyone - they're fun for you, a friend or date, and even a small group. Parties for adults or kids are great for groups of 10 or more (higher minimums apply during weekends and holiday seasons). Gift Cards are available for any occasion - you may purchase online or in the studio. We're located in Mission, Kansas right off of I-35 and Metcalf -- close to you whether you're in Downtown, Midtown, Johnson County, or KCK! Follow us on Facebook and Instagram to hear about studio events, get sneak previews of new art and our monthly calendar, participate in promotions, and just enjoy some fun! We are a BYOB studio. Please feel free to bring your own wine, beer, or any other beverage of choice to enjoy while you paint! Local alcohol laws require you to take any alcoholic beverage containers, including empty bottles, with you when you leave. Classes that allow consumption of alcohol are limited to individuals at least 16 years of age and accompanied by an adult -- you must be at least 21 to consume alcoholic beverages. Check our calendar for family and kids classes. No toddlers or infants. Painting with a Twist may be new to the Kansas City market. But the core principle that drives our organization – caring about others – is in line with the spirit of what makes this city great. What happened on the 6th of July is a perfect example. Our new studio had been open for only a month when we held our first “Painting with a Purpose” event. The goal : to raise money for the Vera Bradley Foundation to fund breast cancer research. With little time for planning and modest funds for marketing, we set out to see if we could hopefully find a few people who would come paint with us for a good cause. The result was incredible. Not only did you buy the 40 seats in our main room, but the response from our wonderful community was so strong that we opened up our private party room and you filled it to capacity as well. More than 60 women showed up; several of them cancer survivors. Together we raised more than $1,800 for this important cause. Many of you probably don’t know the Painting with a Twist story. Our co-founders, Cathy Deano and Renee Maloney, started this company in Mandeville, Louisiana following the devastation of Hurricane Katrina. They had a simple mission: to help raise money for the victims of the disaster while bringing some much-needed fun to their everyday lives. Since then, Painting with a Twist, which was the originator of the “paint and sip” concept, has become an American success story. But to the credit of these remarkable women, it remains steadfastly dedicated to its original purposes of giving back. We’re proud to be associated with such quality people and are anxious to continue this tradition here in Kansas City. For us, the Vera Bradley Foundation event is only the beginning. On Thursday, August 24th we’ll host our second Painting with a Purpose event for Camp Mitiog. This is a wonderful local organization that is devoted to helping kids who suffer from Spinal Bifida. We hope you’ll join us at Painting with a Twist in Mission in supporting their efforts – and we promise you an evening of fun and entertainment to go along with the all the good you’ll be doing. Grand Opening - June 7th! Our GRAND OPENING is June 7th and our staff of fabulous local artists is ready to lead you step by step in creating your own masterpiece! We give you everything you need for a fabulously fun and relaxing night out. It's FUN and yes… YOU can do it! 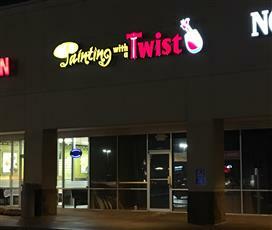 We are totally jazzed to bring Painting with a Twist to the Kansas City area. Our Mission, KS studio is easy to get to whether you live in the Jo, the ‘Dotte, or KCMO! We’re right off of the I-35 & Metcalf/I-635 exchange on Johnson Drive. Check out our calendar to choose the beautiful painting you want to create and book your seat online. We have a variety of painting classes open to the public. It’s only $35 for a two-hour session and $45 for three hours. We also have a few daytime events that are just $25. We’re a BYOB establishment, so you’re free to bring your wine, beer, cocktail, or soft drink to enjoy while you paint. Tipsy’s Liquor is just three doors down and they’ll give you a ten percent discount if you mention that you’re Painting with a Twist! And for a fun snack pop in to Nothing Bundt Cakes next door! Are you planning a special occasion? Contact us to schedule a private party, team building event or to host a fundraiser! Come get your paint on with us for bachelorette parties, birthday parties, bridal showers, corporate events, holiday celebrations, kids' parties, and any other get-together! 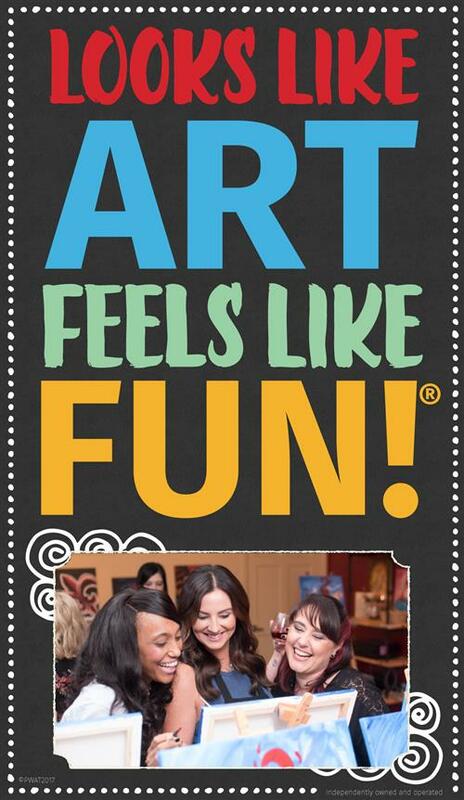 To book your party, email us at: studio329@paintingwithatwist.com or give us a call at 913-701-6379.